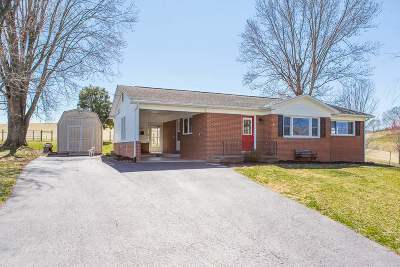 Charming brick home with solid construction, enclosed single carport. This is a nice home with thoughtful updates and ready for its new owner. Cheerful eat-in kitchen, gas range, microwave, refrigerator, new paint and flooring.Handsome oak hardwood floors, fresh paint, and bedrooms all on one level.Master bedroom has 1/2 bath, the other two bedrooms share the hall full bath. But wait, the basement is bright and cheerful too, with a finished family room, office, great storage, laundry and mechanical room. Roof has been replaced 2004, replaced HVAC 2000 and has gas back-up. In addition to the cistern, for the full list price of this home the seller can include a new well to be drilled.The paved driveway makes for easy entrance and exits.